In the past, disabled workers were often the overlooked segment of the workforce. Their disabilities frequently prevented them from having traditional 9-to-5 jobs that often required commuting and other challenging aspects. But new research from the Institute on Disability at the University of New Hampshire, and RespectAbility (a nonprofit that helps to create job opportunities for disabled workers), found that’s no longer the case. In 2016 alone, 343,483 disabled people joined the workforce—four times the number of disabled people who were working in the previous year. What can explain this sudden growth? Well, there are a few factors to consider. First, employers, who are always on the search for top talent, are now expanding their hunt to include workers with disabilities. (There are also incentives for employers to hire disabled workers.) Second, an improving economy is also helping stimulate job growth, creating more jobs to fill. Part of the reason is also culturally based. The media, which at one time may have portrayed people with disabilities in a more negative, stereotypical light, is now showing them in a more realistic, positive way. This helps shape how people perceive persons with disabilities and is contributing to a more inclusive, rather than exclusive, workplace. Perhaps one of the biggest reasons why there has been such exponential growth in the employment of disabled workers is due to technology. 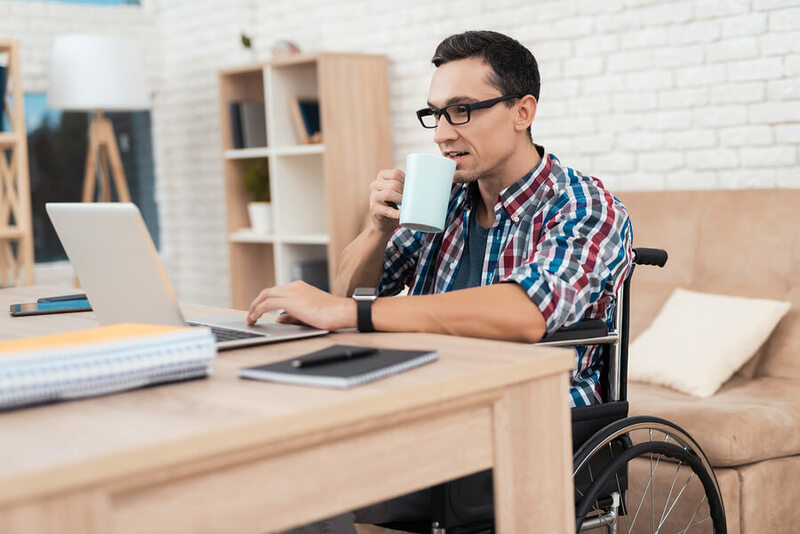 With an also equally remarkable rise in remote and flexible job opportunities, hiring disabled workers for telecommuting jobs makes good business sense. After all, with one in five Americans considered disabled (and subsequently representing the largest minority group in the U.S.), offering flexible work options allows this once-untapped talent pool the chance to work without limitations. In turn, workers with disabilities can positively contribute to their families and their communities while still being able to care for themselves and their needs. Some major companies have already jumped on the bandwagon to include aggressive hiring practices of people with disabilities. For example, Walgreens boasted over 900 employees who were disabled, and another 1,300 disabled workers have also completed retail training. Other companies, such as Starbucks and Pepsi are also proactive about hiring disabled workers. Employers are also finding that disabled workers, like anyone else, can be rockstars in the workplace. Stats show that this segment of the workforce tends to have lower turnover rates, higher productivity levels, and a better safety record than non-disabled workers, making them the talent to hire.